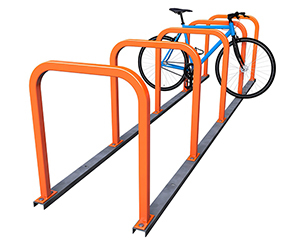 Rail mounted bike racks make adding secure, compliant bike parking for 6 to 12 bikes simple. The 3/16" thick galvanized mounting side rails feature pre-drilled holes, ensuring each attached Downtown Bike Racks is properly lined and spaced. Constructed with square steel tubing, the highly durable Downtown Bike Racks offers an extended width, providing users 2 points of contact for prime bike security. Which also helps make sure bikes remain upright, keeping spaces looking in tip top shape. The all-steel, rail mounted Downtown Bike Racks is ideal in urban spaces, schools or parks or where functionality and safety is a top concern. Available in galvanized or powder-coated finishes.